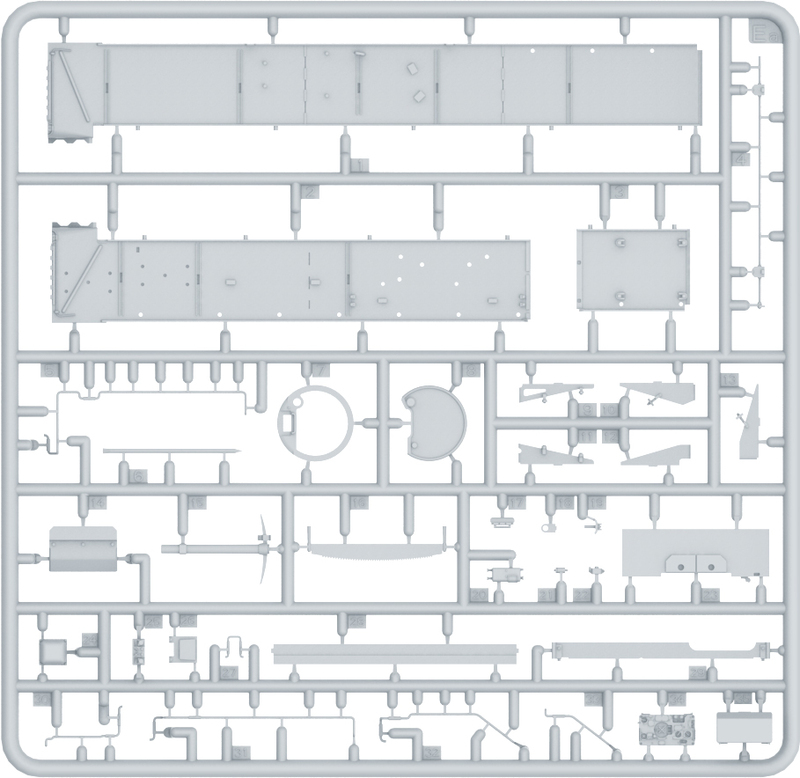 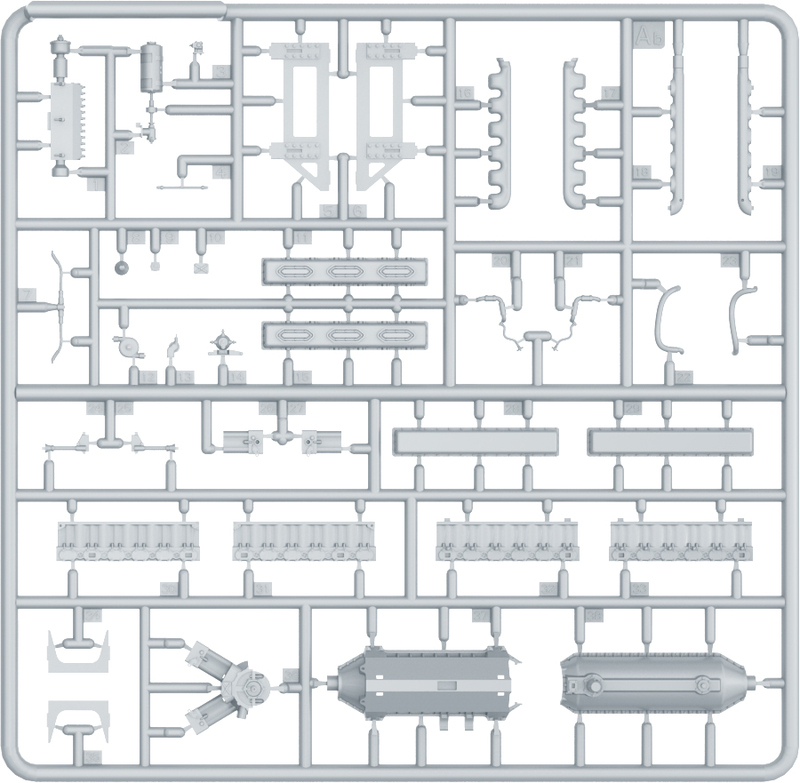 This kit contains 768 parts. 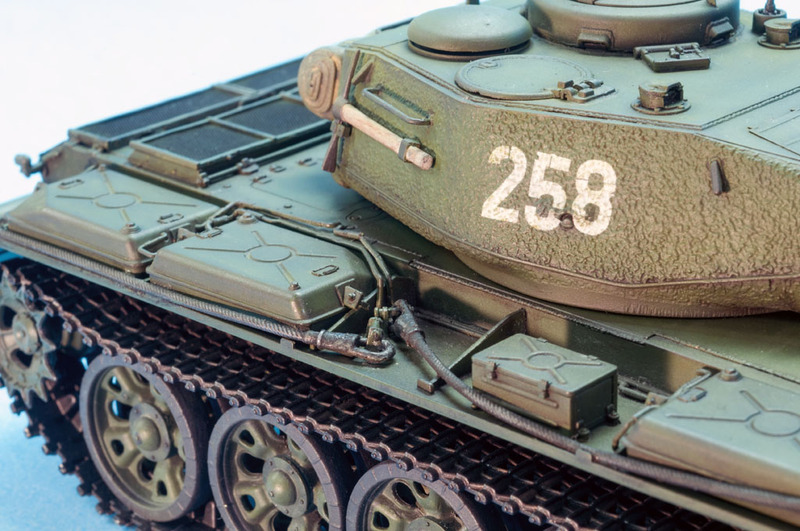 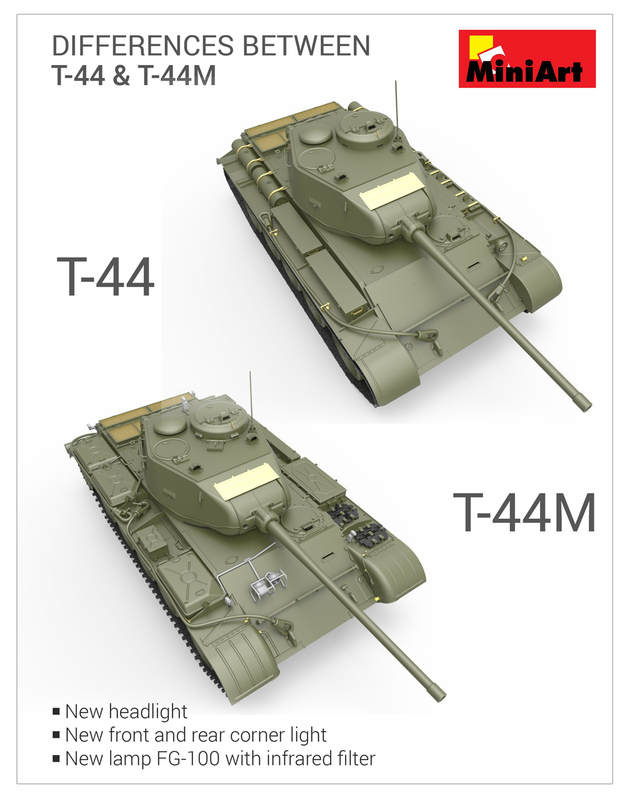 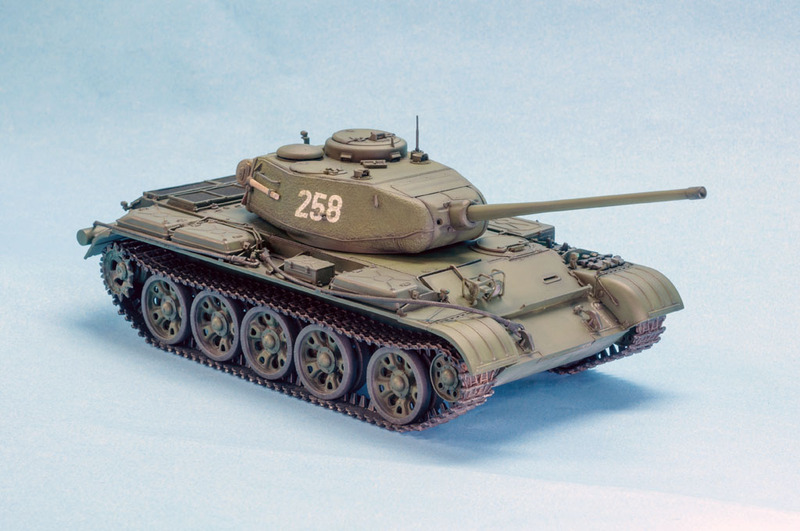 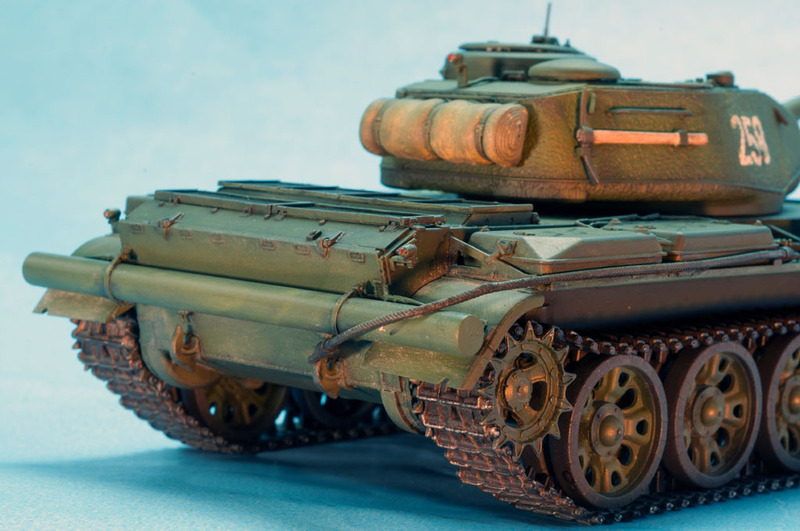 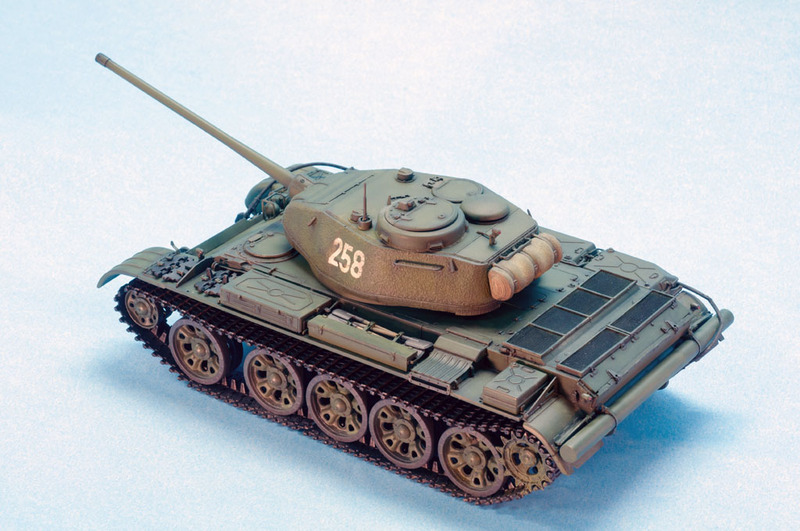 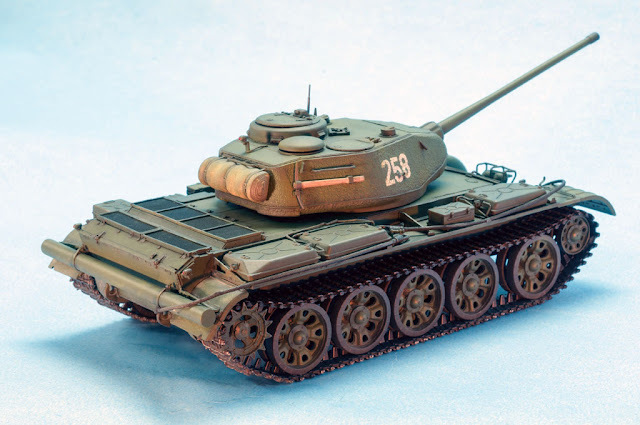 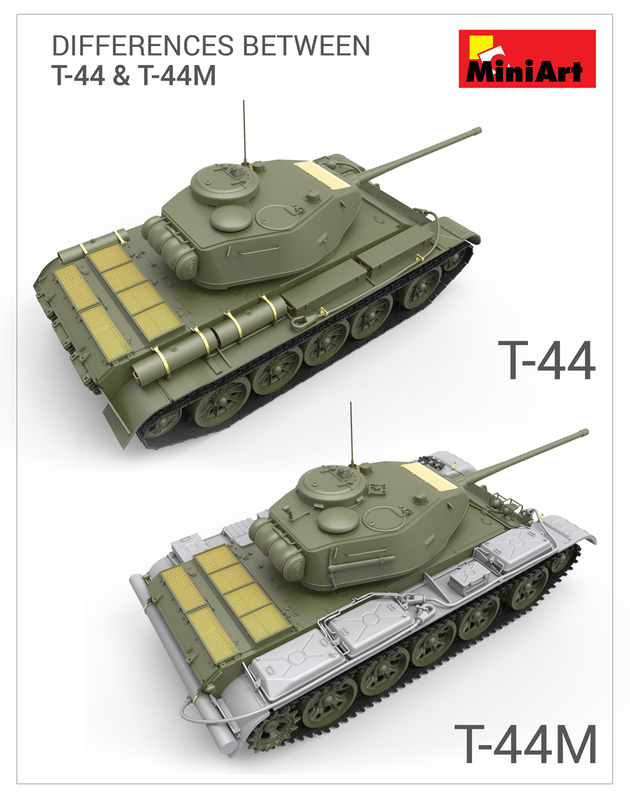 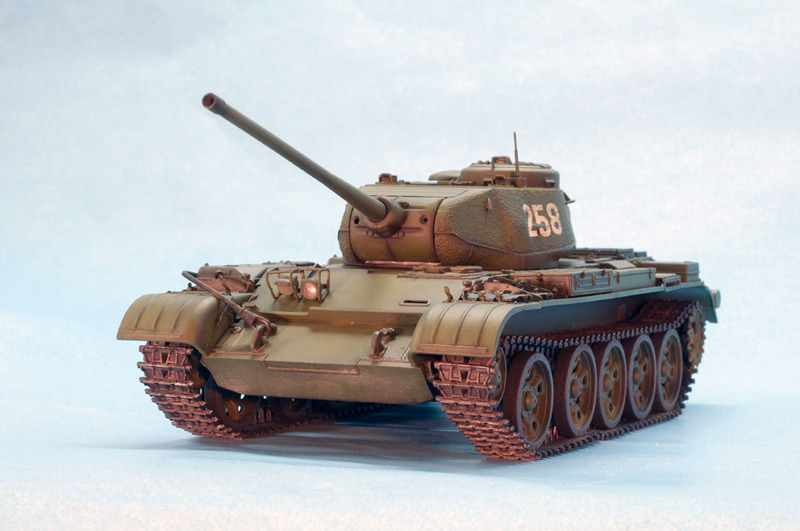 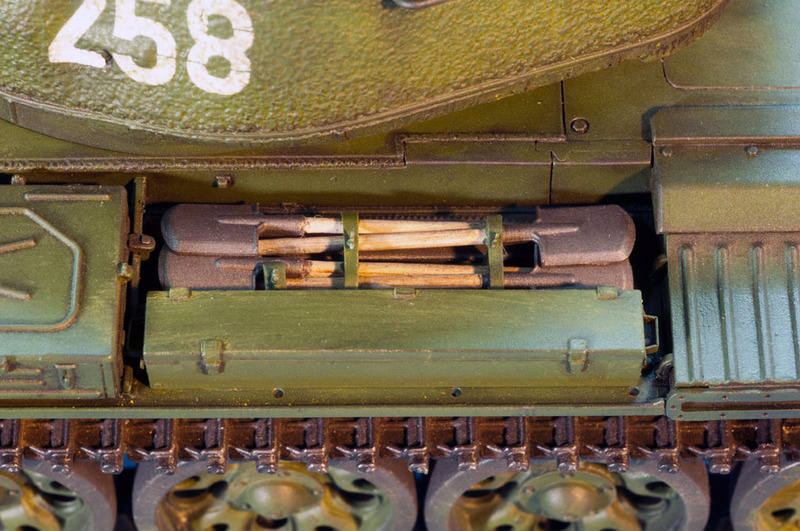 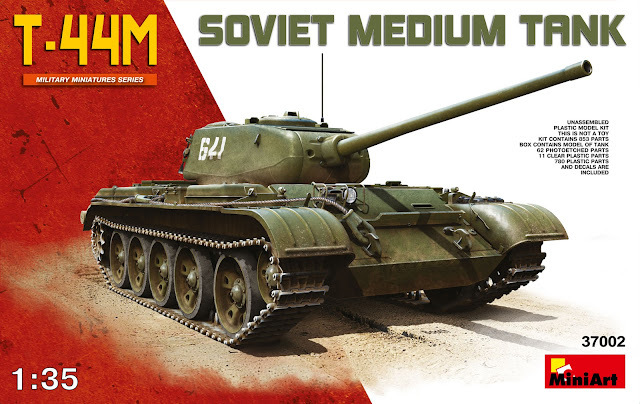 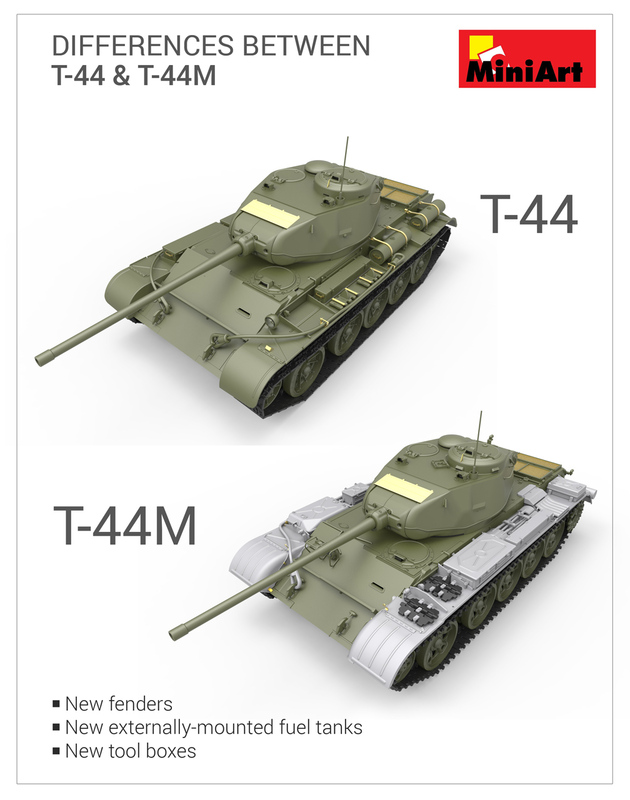 In 1961 the updated T-44M model was brought to life with several features that improved it from the base T-44 (A) version. 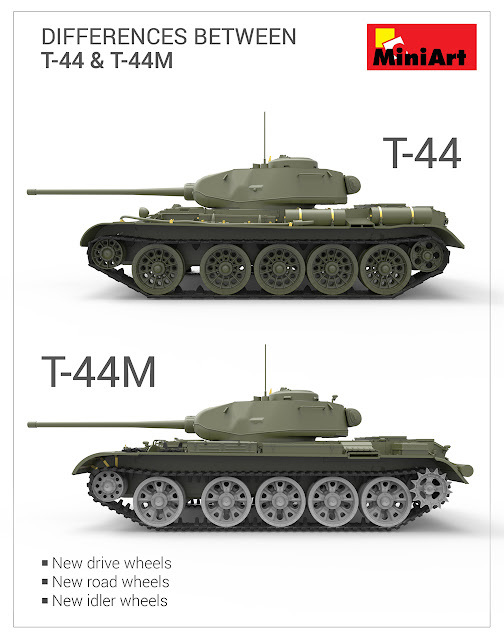 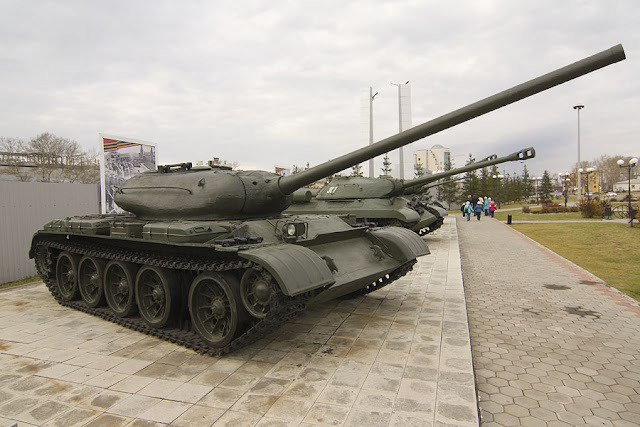 The T-44A modernization program incorporated a drive train upgrade to match the one used in T-54 including the V-54 12-cylinder 38.88 litre water-cooled diesel engine developing 523 bhp (390 kW), gearbox, tracks, 'starfish' road wheels and a conventional toothed drive sprocket, flush with the outer track edge. 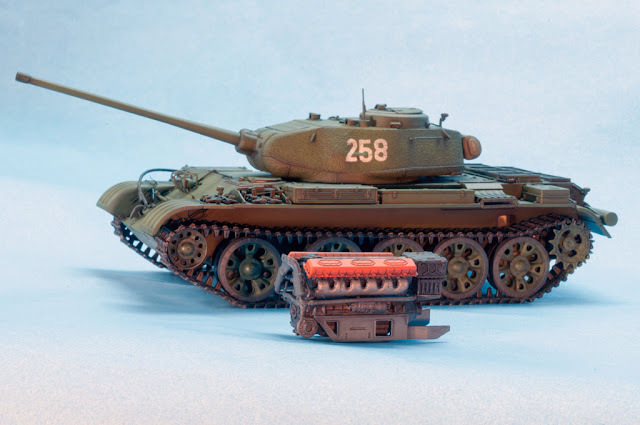 It had an increased ammunition stowage (from 58 rounds to 61 rounds), new R-113 and R-120 radio sets, a heater and infra-red night sight, TVN-2-night vision device for the driver as well as another fuel tank which increased the fuel capacity by 150 litres to 650 litres and 800 litres with additional fuel tanks. 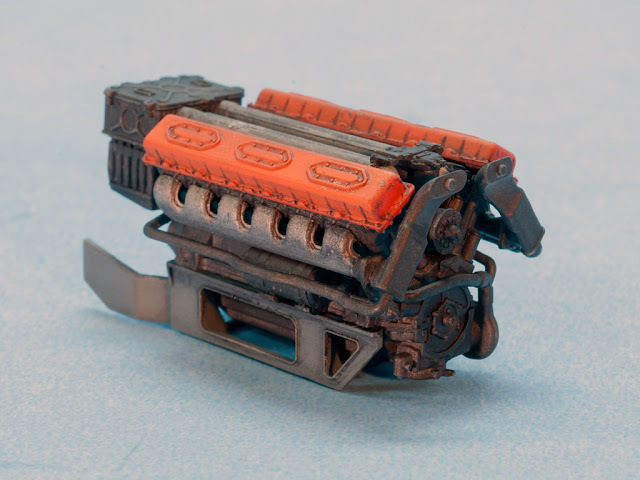 Engine: Model V-54 12-cyl. 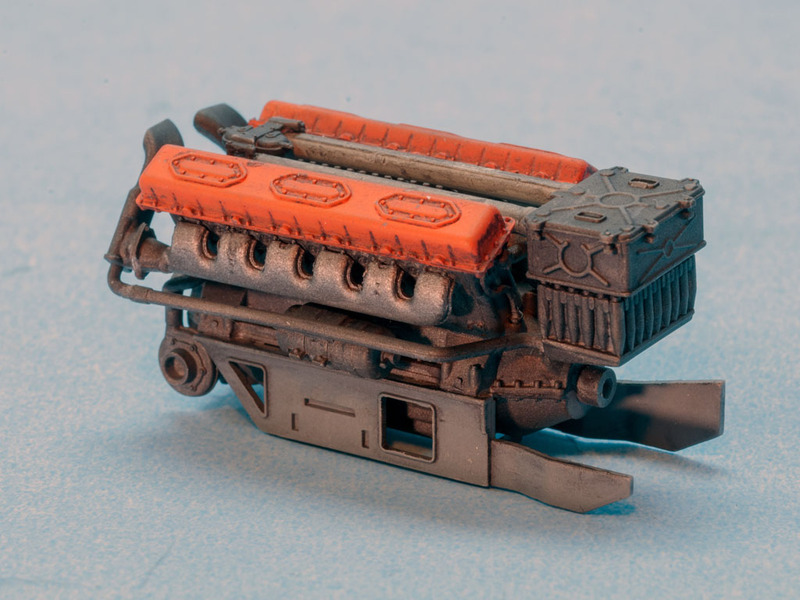 Diesel 520 hp. 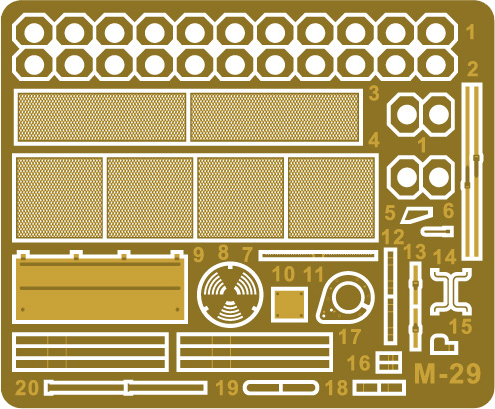 ...As are photo etched pieces as well. 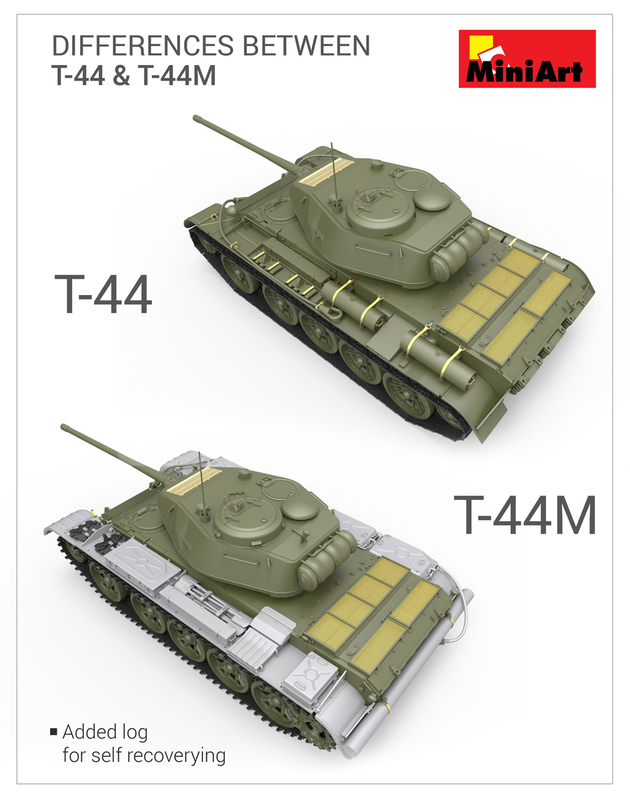 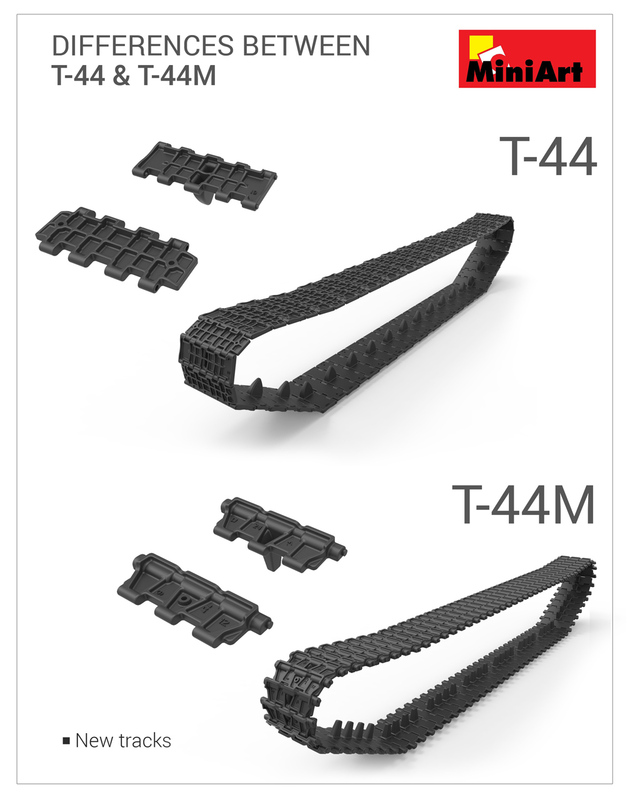 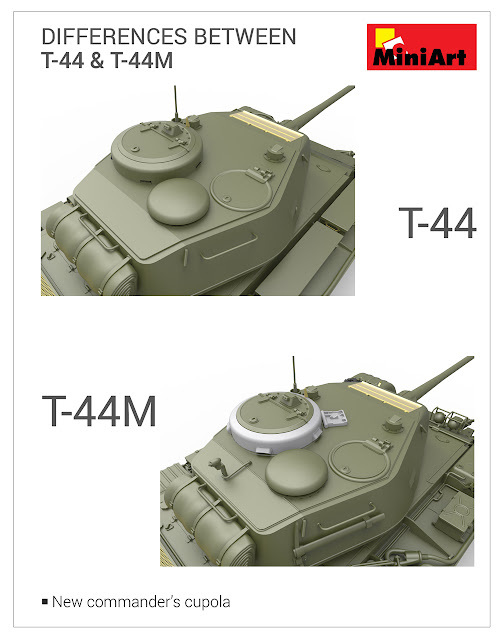 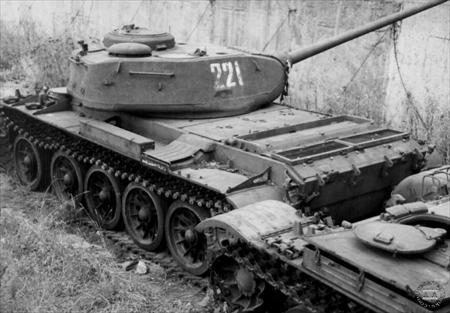 There were several subtle and not so subtle differences between #35193 T-44 and #37002 T-44M Soviet Medium Tank kits. 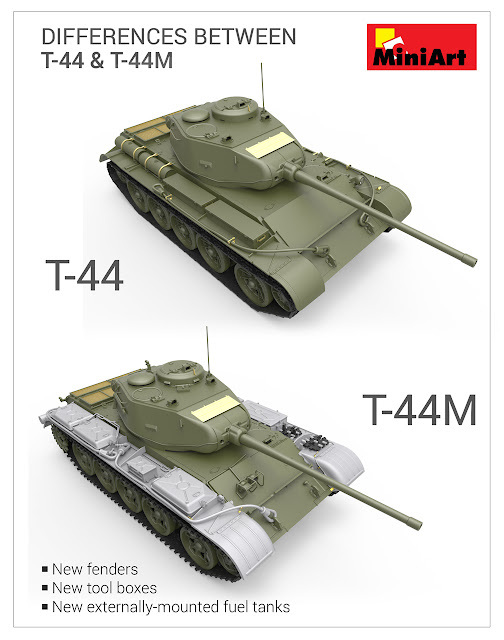 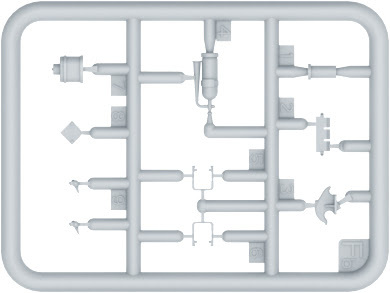 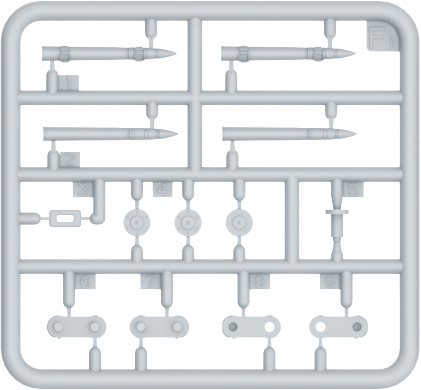 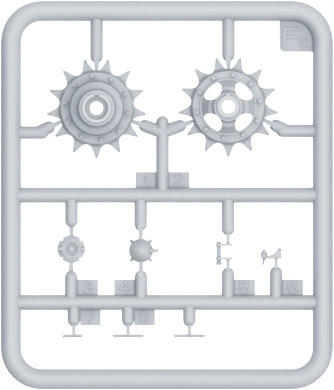 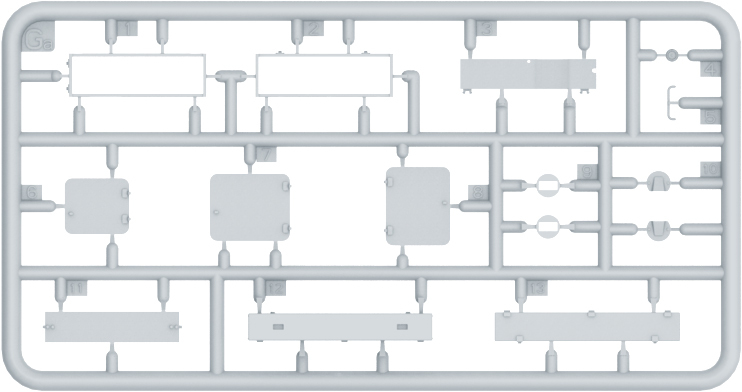 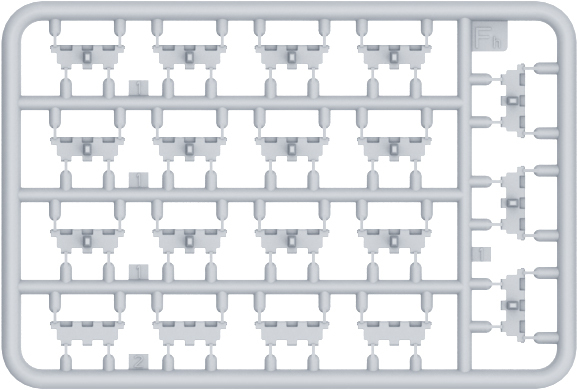 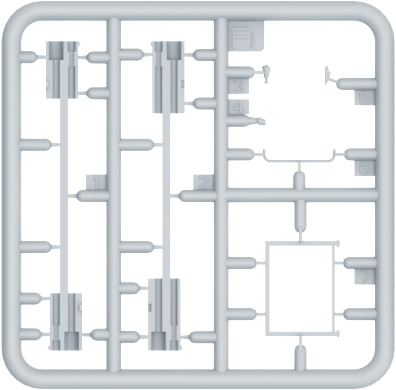 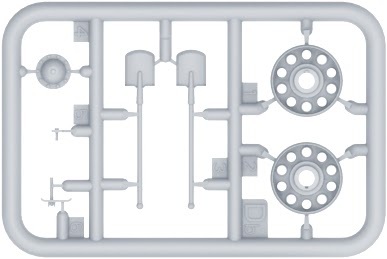 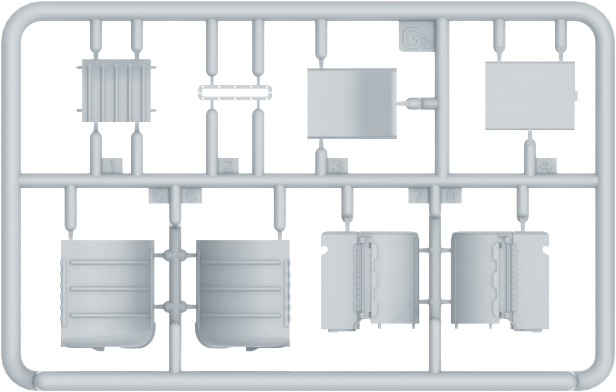 MiniArt have provided an easy reference to show you just what has changed in the new “M” model. 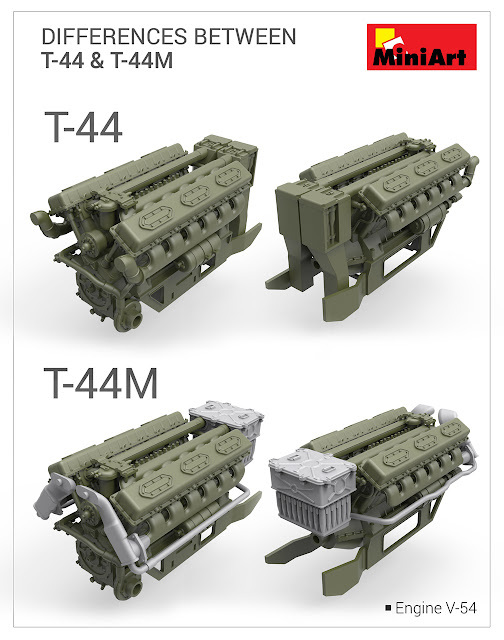 Engine V-44 was changed to V-54 developing 520 hp, 2-VTI dual-purpose air cleaner was changed to one VTI-4 with two stages of cleaning. 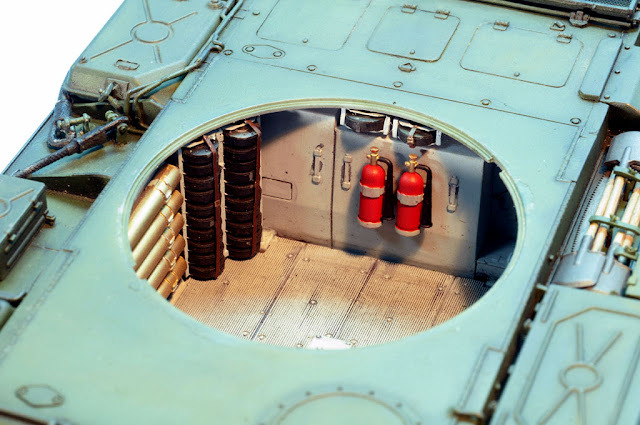 On the right fenders were installed three additional fuel tanks with capacity of 95 litres each of them. 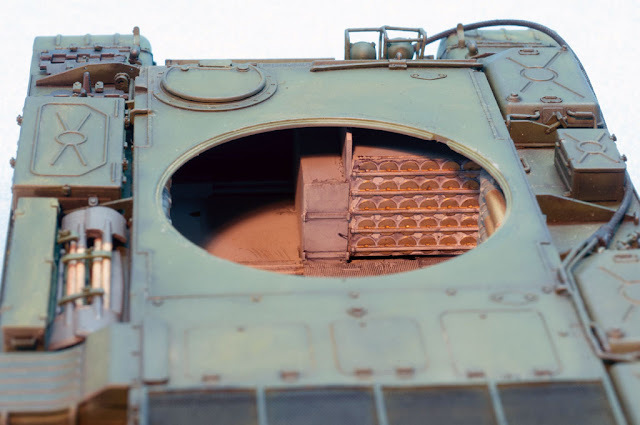 As a result, the fuel capacity was increased to 785 litres, so the maximal road operational range of the tank was increased to 420 km - 440 km. 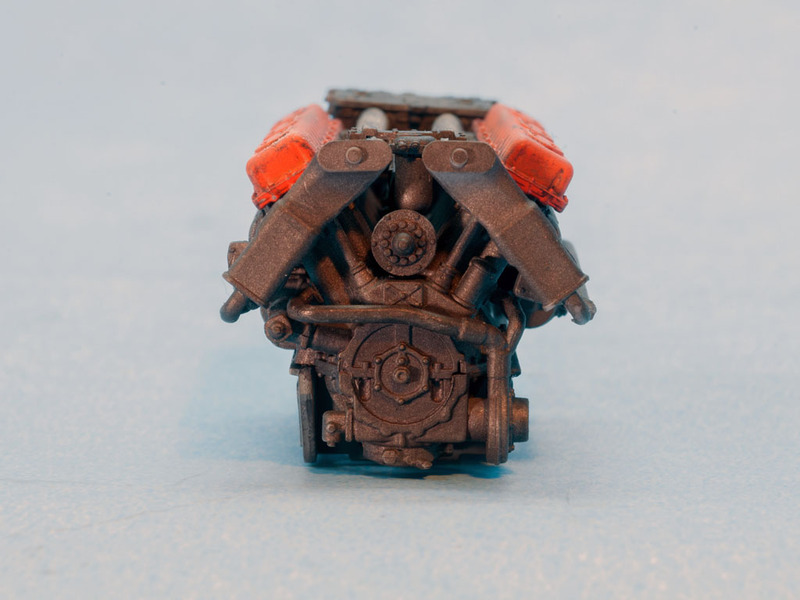 The gearbox and the main clutch were upgraded with planetary steering mechanism instead of side clutches. The chassis of the T-44M was completely modified. 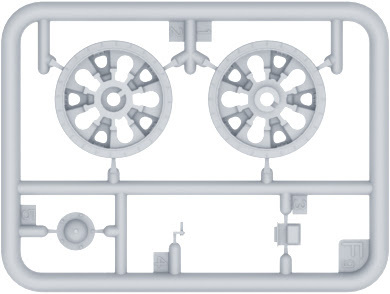 The tank received a new type of track links with new idler wheels and reinforced drive wheel. 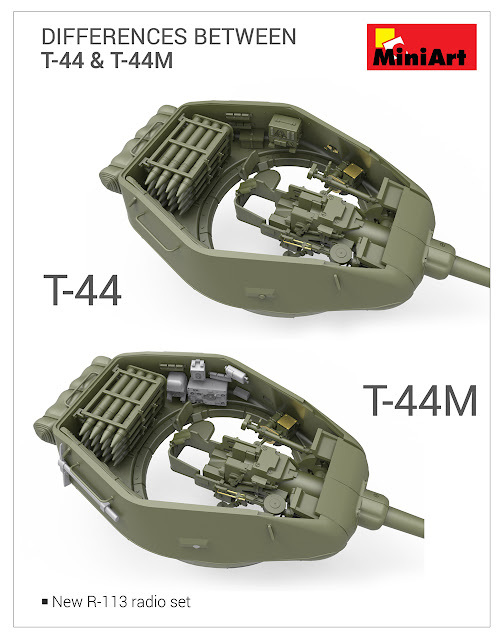 T-44M received a new night vision device TVN-2 instead of MK-4 and a new sight system. 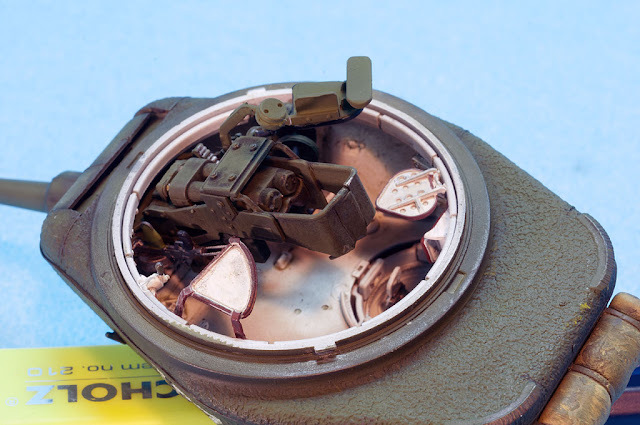 T-44M received front and rear corner light. 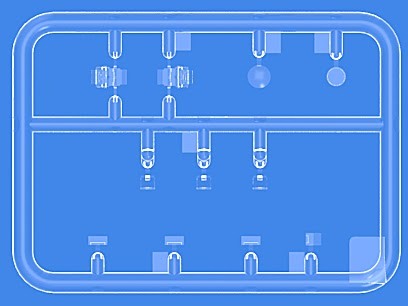 The sound signal was replaced by moisture-resistant signal C-58. 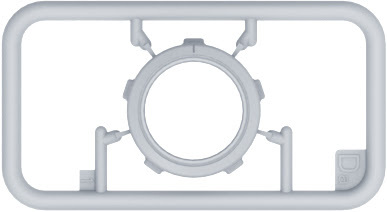 Lamp FG-100 with infrared filter was mounted to illuminate an area when using TVN-2. 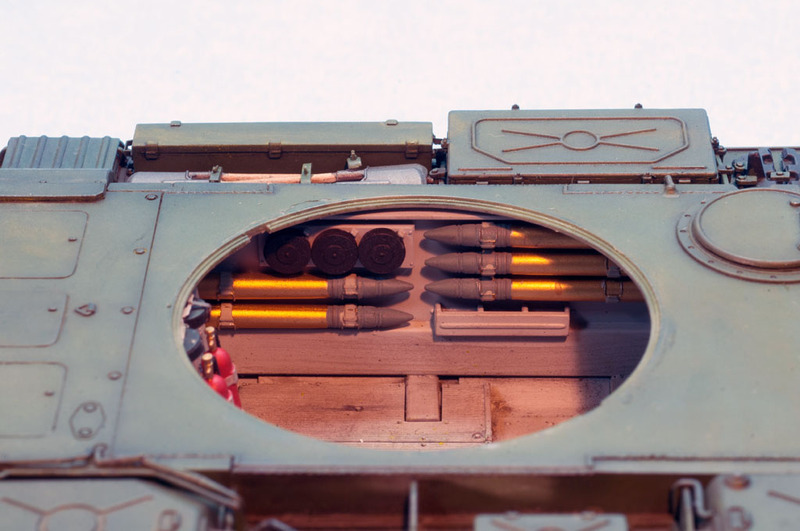 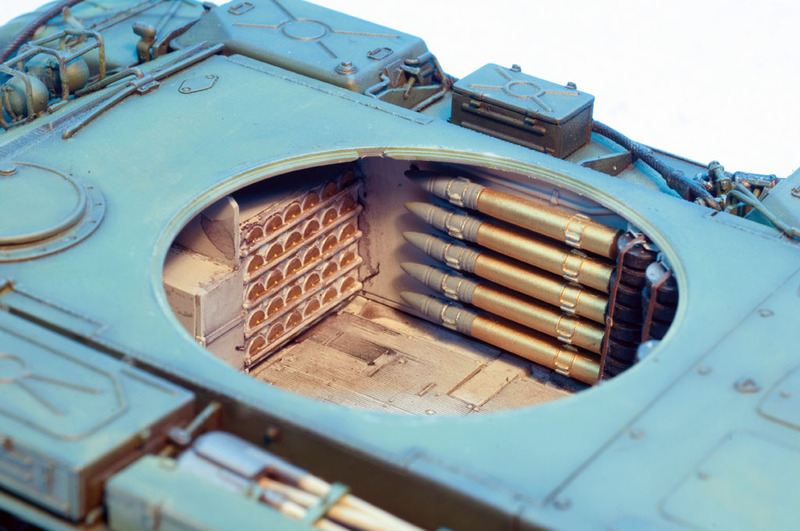 The ammunition stowage was increased from 58 rounds to 61 rounds. 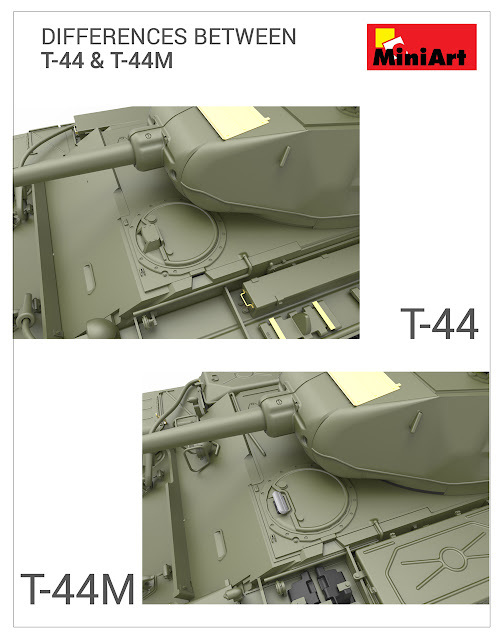 Old 9R radio set was changed to a new R-113 radio set.